No time was wasted the gear was loaded up and I rushed round the lake dumping the porter in the swim. 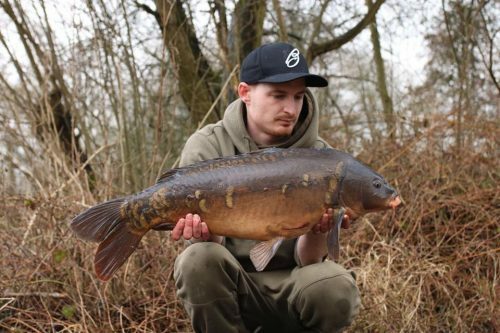 I always find that when you havent got long on the water I tend to bait a few areas at once so I went about doing so, targeting a few areas around the snags before positioning a rod hoping for a chance whilst setting up camp and sorting the other two rods. I like to give them plenty to route around on the bottom for when fishing this way. 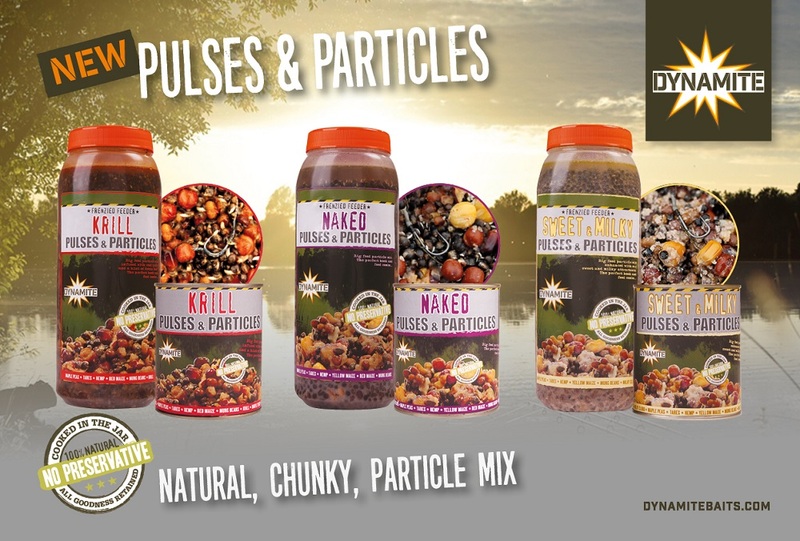 The mix consisted of a combination of the new Dynamite Krill Pulses and Particles mix, Naked particle mix, whole and chopped Monster Tiger Nut Boilies, chopped Frenzied Tiger Nuts, Robin Red essential oil and maggots. Camp was set up and I begun leading around for an open water spot with the plan to fish two rods to the snags and one out in open water, there wasn’t much in terms of a feature as most of the weed had died down for winter. After feeling around all that was found was a smooth silty spot amongst the remanence of the pre-existing weed. The spot was baited with roughly a dozen half spod fulls and while casting out my second rod the rod positioned on the snag line was already sounding and away! 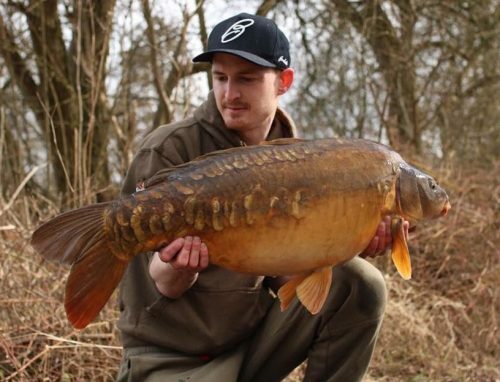 A hard battle later and a 29lb 10oz stunning Blue Pool mirror was in the net. I couldn’t believe my luck, I knew there was a chance to be had on the first day but I wasn’t expecting it to happen that quickly. It was the perfect start to the social and perfect start to the first trip after a long break from fishing due to the birth of my daughter. Buzzing with joy and excitement I quickly checked the rig, changed the hook bait and flocked it back out. The open water rod was re chucked as I’m not even sure where it landed due to the bite coming during the cast and the third rod was positioned along the snag line a bit further into the corner than where the previous bite had come from. During the battle Jason Mooney had arrived to do some filming in the hope of getting some footage involving the new bait products I was using and maybe a fish too, well he couldn’t of asked for more to arrive right at the beginning of the battle, luckily for him his camera gear is always to hand and ready to go. Once the rods were all out we wondered down to the next peg to chat to the other lads and just as my foot stepped into the swim my receiver started going into melt down, after a 20 yard sprint I was into my second fish of the trip this time on the other snaggy spot. The battle seemed tougher, with my other lines in the water the fish was determined to wipe the other rods out but thankfully I kept her away before one of my friends slipped the net under. I couldn’t believe it, it was cold and bleak but somehow I had managed a second before the afternoon was out. This one being a dark mid twenty mirror, the rod was back out immediately, pictures taken and dinner was on. After dinner the lake seemed very bleak and quiet still although Jim had a 27lb mirror around the other side of the lake there was nothing showing or giving anything away. It wasn’t until early hours the next morning I received my bite, again the right hand rod on the snag line was away. 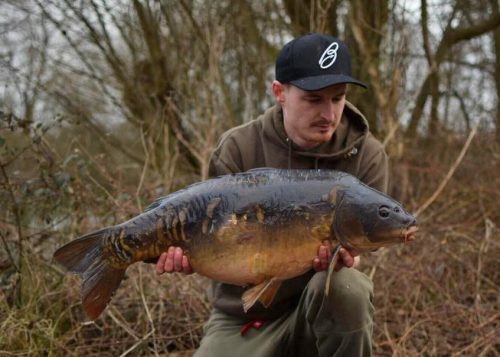 The battle was short and sweet, I knew it wasn’t anything big by the way I was able to steer the fish away from the snags with such ease but none the less a very welcome 16lb mirror to top off the opening 24 hours. I called my friend and fellow Dynamite baits angler Ash Bailey to come and do the pics along with Danos as both had done such a great job the previous day. Ash mentioned he had already had one that morning so it seemed like the fish were spread out and hopefully a few of the other guys had caught also, this wasn’t the case but not long after Alex that was further down the bank had his first of session meaning 4 out of the 7 had caught in the opening 24 hours. The day went on and sadly it turned to disaster for myself, the swans had moved in on my shallow margin spot and really started to cause a lot of commotion, I could even step out the brolley without them homing in on me. I feared my chance was over when one of the swans had manged to get caught up in a bramble over hanging the bankside, I had honestly never seen anything like it, the swan was playing tug of war with the bramble right over my spot, every time it swam two yards the bramble tugged it back to the bank. Well that went on for nearly ten minutes and I was sure he wouldn’t be back but nope less than five minutes later I cracked open a bucket to walk round a sprinkle some bait in and there he was like a tramp on chips. Finally the swans went and bothered Ed and Rob in the far corner of the lake which meant I could sprinkle a bit of bait out and re-position the rods, as myself and Danos stepped into my peg the middle rod was away, unfortunately it was only on for a matter of seconds before the hook popped out, the fish had made a mad charge on a tight line and for what ever reason this time the lead didn’t drop off causing hook hold to be compromised. I was gutted, after feeling the swans had ruined everything a chance was lost. Tail between my legs I tied another rig and re-positioned the middle rod before moving the open water rod onto the snag line with the others, by now it was clear that across the entire lake all bites had come from the edges. Not long after moving the rod over it was away, this time managing to duck under the canopy and snagging me up. I could feel the fish moving and bouncing its way out the snags, finally I felt I was about to redeem myself. As the fish was nearing the edge of the snags I felt all the tension disappear, my hooklink had given way, I was gutted another lost fish! I wound in and noticed a clean cut about an inch down from the lead clip. I couldn’t believe it just as it all seemed like the fish was near to safety it all came undone, I can only imagine that was there a muscle on the under branches causing the clean cut.